For the past couple years I’ve had an obsession with battery-powered cordless tools. While I’ve bought a number of cordless power tools and even a cordless snow blower…what has been missing in my garage is an all-battery lawn mower. For the past couple years, I’ve had my eyes on the EGO Power+ 56V Lithium-Ion Self-Propelled Mower. The trigger for me to buy the EGO was Home Depot’s recent price drop of $100 on the LM2102SP mower which brings down the price from $599 to $499. There is some discussion whether this sale price is permanent or not. Last year, Home Depot’s “New Lower Price” dropped the mower’s price by $50 only to go back to its original price within a month or two. I never saw a lower price for the mower at Home Depot the rest of the year. 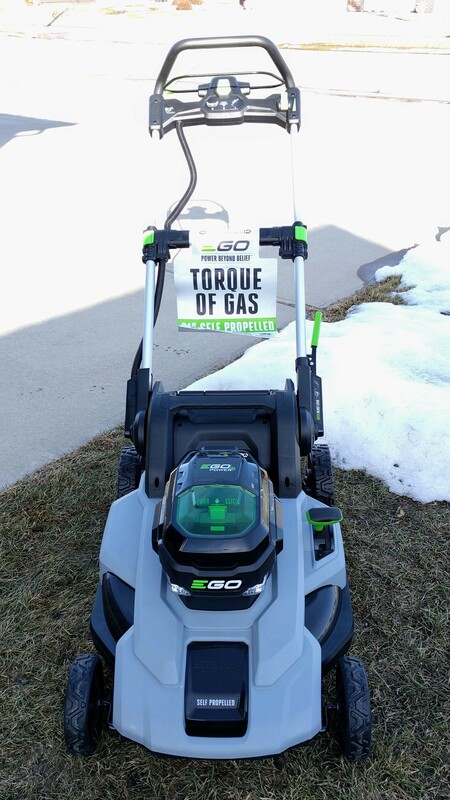 This year, I didn’t want to take a chance so I bought the EGO mower in March with South Dakota snow still on the ground. The salesman at Home Depot said this was the first mower he personally sold in the 2018 season. Needless to say, I have at least a month to go before I see enough green on the lawn for the first cut of the season. Before I bought this mower, I was considering a few others based on reviews I found online. One mower I was considering was from the GreenWorks Pro 21-inch 80V line (although the self-propelled version is a hard find). I also considered the Lowes exclusive Kobalt 80V Self-propelled currently priced at $549 (and as far as I can tell is actually a GreenWorks under a different brand name). Another mower on my radar is the Yard Force 22-inch Self-Propelled Mower running on a 120V Lithium-ion battery. Unfortunately, the Yard Force mower is so new that with so little reviews and at a steep price, my wallet said “no”. For those of you that aren’t comfortable with buying a mower with a “polymer composite” deck, you should consider taking a look at EGO’s 20-inch lawn mowers with a steel deck. Both the 21-inch and the 20-inch mowers come with a 5-year warranty on the mower and a 3-year warranty on the battery/charger. When the weather gets warmer, I plan to review my new EGO mower in detail.